PROFESSOR KRISTIN INGOLFSDOTTIR IS A FORMER RECTOR OF THE UNIVERSITY OF ICELAND, WHERE SHE PUSHED FOR DIGITAL TRANSFORMATIONS. SPEAKING AT THE SEPTEMBER WLS IN KRISTIANSAND. PIONEER IN LEARNING DESIGNS. PRESIDENT OF WEBSTUDENT INTERNATIONAL. SPEAKING AT THE SOLO ROUNDTABLE. PROFESSOR, UNIVERSITY OF TEXAS AR AUSTIN. CO-FOUMDER OF THE LEADING WOMEN PROJECT. SPEAKING AT THE OSLO ROUNDTABLE. FOUNDER OF ADAPTO, AN ONLINE WORKLIFE LEARNING COMPANY. PHD IN DIGITL LEARNING FROM AALBORG UNIVERSITY. DIRECTOR, LEARNING GROUP @ O'REILLY MEDIA. 30+ YEARS OF AI EXPERIENCE RANGING FROM BELL LABS TO EARLY-STAGE STARTUPS. SPEAKING AT THE SEPTEMBER WLS IN KRISTIANSAND. DIVISION DIRECTOR AT KULTURTANKEN - NORWEGIAN MININSTRY OF CULTURE. BOARDMEMBER AT THE FUTURE LEARNING LAB. SPEAKING AT THE OSLO ROUNDTABLE. PROFESSOR, UNIVERSITY OF AGDER AND NLA UNIVERSITY COLLEGE. CHAIR OF WORLD LEARNINF SUMMIT. FOUNDER FUTURE LEARNING LAB. CO-FOUNDER, HOUSE OF TUTORS. ENTREPRENEUR AND FOUNDER OF MENTORSHIP PROGRAMS FOR IMMIGRANT WOMEN. SPEAKING AT THE WLS IN KRISTIANSAND, SEPTEMBER 2018. CURRENTLY VICE PRESIDENT OF INNOVATIONS @ SALESFORCE, PHIL HAS A 20 + YEAR BACKGROUND FROM LEVERAGING EMERGENT TECHNOLOGIES IN HIGHER EDUCATION. SPEAKING AT THE OSLO ROUNDTABLE. FOUNDER, NORDIC EDTECH NETWORK. STRATEGIC GROUP FOR EDTECH - SILICON VIKINGS, PALO ALTO, CALIFORNIA. SPEAKING AT THE OSLO ROUNDTABLE. CONSULTANT AT THE CENTER FOR CREATIVE LEADERSHIP, OSLO. CO-FOUNDER OF CULTURE ENGINE, PALO ALTO. SPEAKING AT THE OSLO ROUNDTABLE. Registration and Coffee + Connect and Mingle at Litteraturhuset. Hosted by Future Learning Lab staff. VIP -- sponsored breakfast workshop with Future Learning Lab and EdCast. Contact us to sign up. Limited availability. 10 spaces reserved by Open Innovation Lab of Norway. Max 10 spaces still available. Reflections and discussion: Keith Devlin, Michael Shanks, Donna Kidwell. VIP venue for those signed up. General lunch in Litteraturhusets cafe. Roundtable 1: Artificial intelligence and Big Data - changing the way we think about learning. Framework presentation: Phil Komarny, Vice President of Innovations, Salesforce Int. Roundtable 2: Adapting to new learning and skills at the work place Framework presentation: Janet Walkow, Professor at University of Texas, Austin Panelists: June Breivik (Kulturtanken), Signe Shack Noesgaard (Adapto, Denmark). Fireside chat, with Karl Mehta, Keith Devlin and other guests. Nordic challenges of work and learning. The final session will sum up the day and result in a joint Roundtable Paper. Join up to be sound your ideas and opinions. 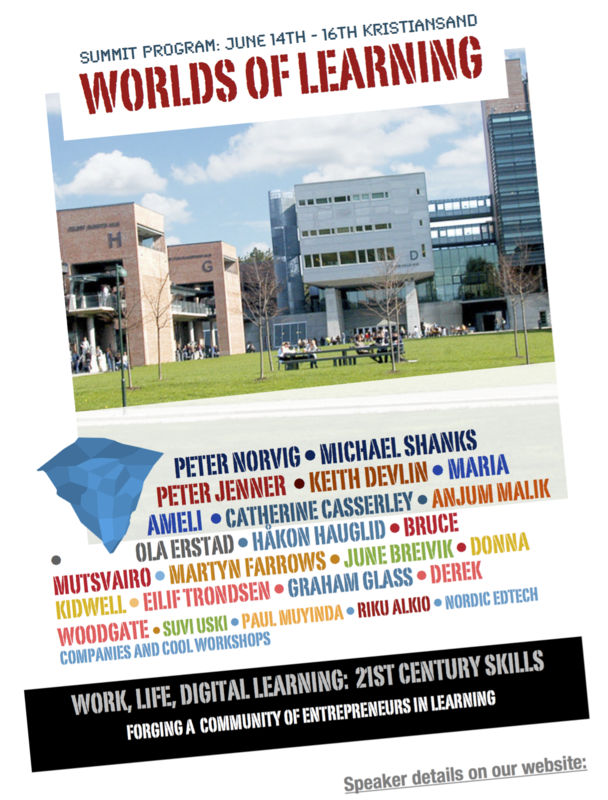 Future Learning Lab was established in 2010, to develop a university-wide dialog at the University of Agder in collaboration with key academic and entrepreneurial environments around the world. Our conferences have been held annually, and in 2018 expands to include the Oslo Roundtable. Former speakers include Peter Norvig — Head of Research at Google, Michael Shanks @ Stanford University, Sir John Daniel well known from UNESCO, ad many more. © Copyright 2018. FUTURE LEARNING LAB. Speaking at the 2017 World Learning Summit was a great honor.